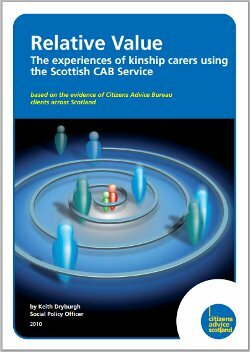 The experiences of kinship carers using the Scottish CAB Service. All across Scotland, thousands of people care for children, because their natural parents are unable to do so. These are often grandparents, aunts and uncles but can also be family friends. People who look after children in these kinds of circumstances are often known as 'kinship carers'. This research is looks at the experiences of a sample of 368 kinship carers who called the Kinship Care Helpline or visited a bureau for advice between January and December 2009.